Brian Baumgartner with the VIP ticket winners at the Maroon 5/Counting Crows show. Previously posted items after the jump. Good at Office trivia? Answer some questions for a chance to win VIP tickets to hang out with Brian Baumgartner at the July 26 Maroon 5/Counting Crows show at the Toyota Pavilion at Montage Mountain! Contest ends Friday, July 25 at 12:01 a.m.
… Brian Baumgarten [sic], who plays “Kevin” on the show, will make an appearance in Scranton on July 25, Mr. Doherty said. He is scheduled to attend a Counting Crows concert and visit city landmarks. Aaah Counting Crows. They’re from the Bay Area. Berkeley to be exact. Counting Crows in Scranton! High rollin’. I love that his schedule includes activities for his own entertainment. Tanster, will you be attending? 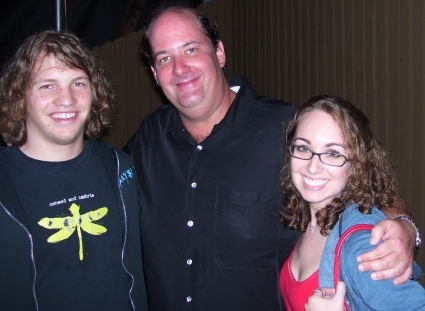 Misspelling Brian Baumgartner’s name makes me [sic], too. I might be going that! Oh man I’m going to that concert! this is amazing that he’s going to be there too! I live 40 minutes from Scranton! Ahh, I wish I could go. I heard he’s going to be announcing the bands or something like that. haha. not sure. Aw wish I could go! Have fun whoever does win though! Scranton people, go! I love Brian. I entered… I figure it’s a definite long shot, but of course I would be BEYOND thrilled if I won! Wish me luck! What a great find, thanks for letting us know. Can’t stop laughing at Shrutastic’s comment! Some lucky dog’s gonna win it–I hope it’s a Tallyhead! Nice Coheed shirt kid…Counting Crows are great too. Next PostNext Welcome back, Office cast and crew!